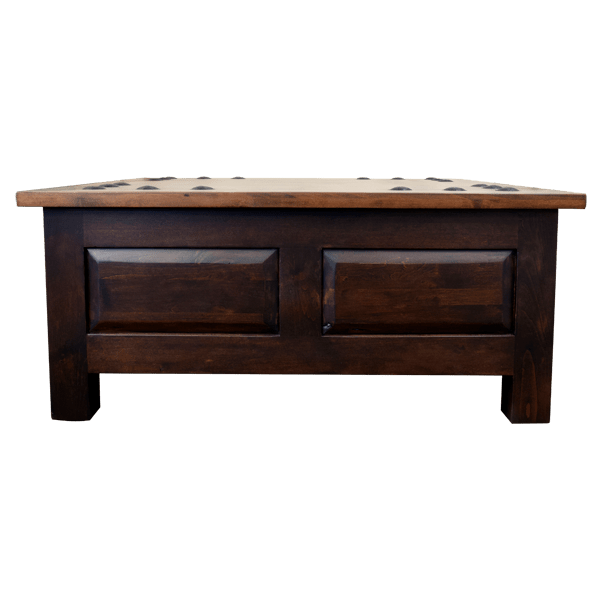 With its dark, antique finish, this handcrafted, Western style coffee table will blend easily with your existing Western décor. The coffee table features an open, square top with a classic, straight top rim. Each corner of the top of the coffee table is embellished with large, hand forged iron nails hand tacked in a “L” design. Each of its sides have two, vertical, rectangular cut panels, and the coffee table rest on square cut feet. The coffee table is made with the best, sustainable, solid wood available, and it is 100% customizable.